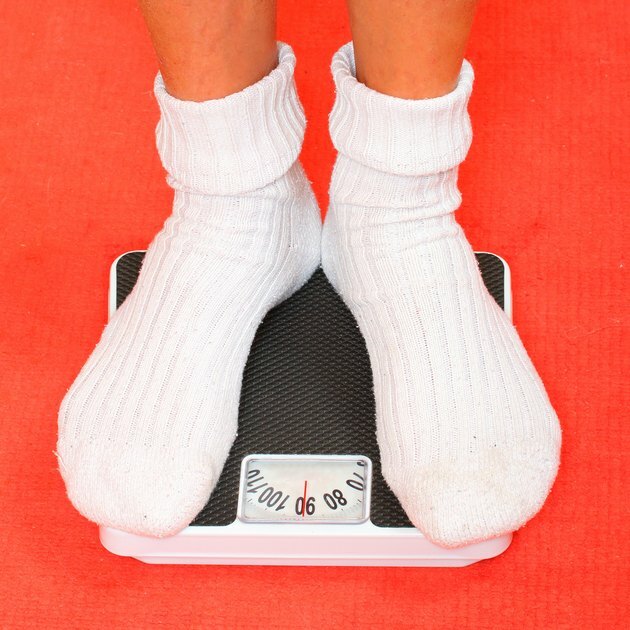 How Can I Lose 25 Lbs. of Fat in Four Months? Erin Beck began writing professionally in 2008 as an opinion columnist for the West Virginia University student newspaper, "The Daily Athenaeum." She has worked in health promotion at the university and as a communications intern at the National Alliance on Mental Illness. She has a Bachelor of Science in journalism and a Master of Public Health, both from West Virginia University. Losing 25 lbs. in four months is a reasonable, attainable weight loss goal. To lose 25 lbs. of fat in four months, aim for about 1 1/2 lbs. of weight loss a week, or a little more than 6 lbs. each month. Gradual weight loss of a pound or two a week is recommended because slow weight loss is more likely to stay off long-term. Slow weight loss is also more likely to be fat, not muscle and water. Focus on making lifestyle changes, not short-term fixes. Consult your health care provider before beginning a weight loss program. Your doctor can help you make personalized goals and may refer you to a dietitian. Cut 500 calories from your total intake each day. Without exercise, reducing your calorie intake by 500 calories each day will result in a 1 lb. weight loss each week. Take a look at your normal diet and decide on areas you can cut back. For instance, you could drink fewer soft drinks, cut back on sweets or eliminate fast food from your diet. Burn off an extra 250 calories each day with physical activity. Cutting 500 calories from your daily diet and burning 250 calories with physical activity will result in a 1 1/2 lb. weight loss per week. A 150-lb. person can burn 250 calories with 35 to 40 minutes of moderately-paced swimming or 50 minutes of walking at a 3 mph pace. Read nutritional labels and become better acquainted with food portions. Try eating on smaller plates to limit portion size. Many restaurant meals are double or triple the size of a normal meal. When eating out, take half your food home with you. Learn to distinguish between hunger and appetite. When you're truly hungry, even foods that aren't your favorites will be appealing. Appetite often occurs in the absence of true hunger as a result of boredom, anxiety or fatigue. Learn other ways to cope with your emotions, such as starting a journal, trying a new hobby or playing music. Eat breakfast every day. Eating breakfast can help curb hunger and prevent overeating later in the day. Choose foods with complex carbs and filling protein. Have oatmeal and fruit, yogurt and granola or bran flakes with skim milk. Eat the foods you love in moderation. Don't deprive yourself of your favorite sweets. Instead, eat smaller portions and save them for once or twice a week. Diets that are too restrictive are often doomed to fail. How Many Calories are Burned on a 15-Minute Run?